Toronto, Fitzhenry & Whiteside, 2000. Kindergarten-grade 3 / Ages 4-8. Now it was autumn and the chestnuts were ripe. Everyday Anya searched the ground for fallen chestnuts, but none had fallen. She stared up at the spiky green balls and whispered, "Please fall. Fall for me." But the chestnuts did not budge. Author/illustrator Halina Below does a lovely job with this story which serves a dual purpose. 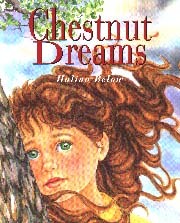 It is a charming story about a young girl waiting for chestnuts to fall. 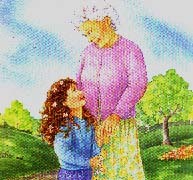 However, this story also serves as a useful tool to demonstrate to younger children how a tree grows. The reader follows Anya through her excited waiting and searching for the "jewels of the tree" to fall for her. For many adult readers, Anya's actions will bring back memories of gathering fallen chestnuts; of filling skirts, pockets and purses with these treasures. Perhaps this story will encourage a new generation of gatherers. I found myself searching for Below's clever little squirrels on each page. My favourite illustrated page includes the view of just the back end of a squirrel busy inside a hole in the Chestnut tree. Below's illustrations are colourful and detailed. Anya's curly chestnut brown hair and brilliant green eyes draw the reader's attention on every page. This book also includes a Did You Know? section about Horse Chestnuts, a diagram of the life cycle of a Horse Chestnut tree and a glossary. A great addition to classroom and library nature collections. This combination of lovely detailed illustrations and a charming story is too tempting to pass up. I will be sure to read this book at a Fall Storytime. Maybe I can even find some chestnuts to share. Catherine Hoyt is the Curator of the Eileen Wallace Children's Literature Collection at the University of New Brunswick, Fredericton, NB.